You know what today is, right?? Just one of my favorite food-sharing days of the week!! Well, I love to share food any and every day of the week, but Tuesday holds a particularly special place in my foodie heart. You know, because…tacos!! 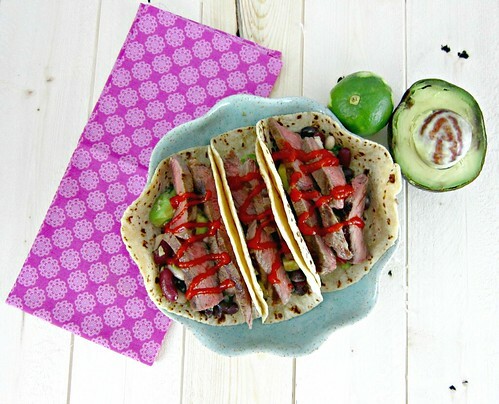 Did you guys know that I now have 78 taco recipes on the blog?? Seventy. Eight. That’s a lot of freakin’ tacos!! Since I love tacos so much, I’m always on the look out for new ones to try, or for an idea to hit me for a new one to create. This was one of the latter. I don’t even know when or where the idea struck me, but coconut and lime, yes. Steak, why not?? And then top it with Sriracha for a little kick? Don’t mind if I do! It wasn’t until the day of that I decided to make what was going to be the side dish, a part of the taco itself. The coconut and lime marinated into the steak so well, and kept it moist and with just the subtle hint of their flavors. And just that little bit of kick from the Sriracha gave it a balanced flavor profile, especially with the vinegary tang and little bit of sweetness in the bean salad. 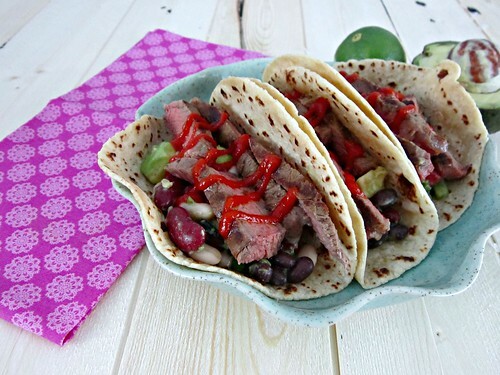 You’ll get plenty of protein and more than a little flavor when you bite into these tacos! Combine coconut milk, lime juice and zest in large resealable plastic bag and stir or use hands to squish the outside and mix together. Place the steak in the bag, seal and turn and squish to coat it well with the marinade. Place in the refrigerator for at least an hour, up to 24 hours. Preheat a grill pan or skillet over medium-high heat, spray with cooking spray or a light drizzle of olive oil. Remove the steak from the marinade, letting excess marinade drip off the steak before adding it to the hot skillet. Discard the remaining marinade. Cook without moving for 3-4 minutes, to get a good sear, then flip. Cook for an additional 3-5 minutes, depending on thickness and your desired doneness. Ours came out medium, but was a pretty thick steak and cooked approximately 8-9 minutes total. Remove to a cutting board and allow to sit for 5-10 minutes so the juices can settle, before cutting into thin strips, against the grain. Warm your tortillas, top with a couple of spoonfuls of the Mexican three bean salad, then 4 or 5 pieces of steak, and a drizzle of Sriracha. Now, sit down because this taco might knock you off your feet it’s so good! !